William Worley, age 23, born in Pennsylvania; occupation: none. Maria/Mary Ann Worley, born c1853; married John Dipple. Johnathan H. Worley, born c1854. William John Worley, born May 1857. Jane "Jennie" K. Worley, born c1859; married James Kline. Nora B. Worley, born c1873; married William Smith. Rosa/Rose M. Worley, born c1875; died c1891, age 16. William Worly, age 30, born in Pennsylvania; master carpenter; $250 personal property. Ellen Worly, age 26, born in Pennsylvania. Maria Ann Worly, age 7, born in Pennsylvania; attended school. Johnathan H. Worly, age 6, born in Pennsylvania; attended school. William J. Worly, age 4, born in Pennsylvania. Jane K. Worly, age 1, born in Pennsylvania. Worley, William, age 43, born in Pennsylvania; house carpenter; $500 real estate; $200 personal property. Worley, Elanora, age 40, born in Pennsylvania; keeping house. Worley, Mary A., age 18, born in Pennsylvania. Worley, Jonathan H., age 17, born in Pennsylvania; carpenter; attended school. Worley, William J., age 13, born in Pennsylvania; attended school. Worley, Jennie K., age 11, born in Pennsylvania; attended school. Worley, Sallie B., age 9, born in Pennsylvania; attended school. Worley, James L. [initial unclear], age 7, born in Pennsylvania; attended school. Worley, Ellie E., age 5, born in Pennsylvania; attended school. Worley, Candace, age 2, born in Pennsylvania. Worley, Clamentine, age 10 months, born Sept  in Pennsylvania. Worley, William J., age 53, born in Pennsylvania; parents born in Pennsylvania; carpenter. Worley, Ellen, wife, age 49, born in Pennsylvania; parents born in Pennsylvania; keeping house. Worley, William, son, age 23, born in Pennsylvania; parents born in Pennsylvania; laborer; unemployed 3 months. Worley, Ellen E., daughter, age 15, born in Pennsylvania; parents born in Pennsylvania; attended school. Worley, Anna C., daughter, age 11, born in Pennsylvania; parents born in Pennsylvania; attended school. Worley, Kate I., daughter, age 9, born in Pennsylvania; parents born in Pennsylvania; attended school. 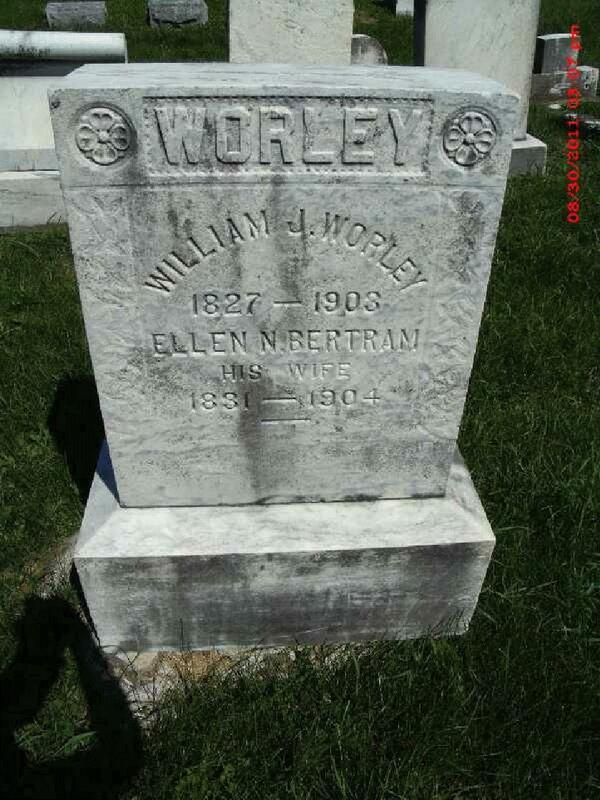 Worley, Nora B., daughter, age 7, born in Pennsylvania; parents born in Pennsylvania; attended school. Worley, Rosa M., daughter, age 5, born in Pennsylvania; parents born in Pennsylvania. Worley, William, head-of-household, age 73, born May 1827 in Pennsylvania; father born in England; mother born in Pennsylvania; married 50 years; occupation: carpenter; owned home (free). Worley, Elanora, wife, age 68, born Sep 1831 in Pennsylvania; parents born in Pennsylvania; married 50 years; 13 children, 8 living. Worley, Emma, daughter, age 30, born Sep 1869 in Pennsylvania; parents born in Pennsylvania; single. 1860 census, Milroy P.O., Armagh Township, Mifflin County, Pennsylvania; roll M653-1141, page 47, line #10, dwelling #317, family #316. 1880 census, Brown Township, Mifflin County, Pennsylvania; roll T9-1156, ED 169, page 31B, line #7, dwelling #157, family #175. 1900 census, Brown Township, Mifflin County, Pennsylvania; roll T623-1441, ED 130, page 4B, line #72, dwelling #84, family #90. RootsWeb WorldConnect data by Amy Baker Daugustine (). 1850 census, Cumru Township, Berks County, Pennsylvania; roll M432-754, page 351, line #12, dwelling #248, family #264. 1910 census, Brown Township, Mifflin County, Pennsylvania; roll T624-1376, ED 109, page 52B, line #55, dwelling #342, family #365. 1900 census, Brown Township, Mifflin County, Pennsylvania; roll T623-1441, ED 130, page 4B, line #68, dwelling #83, family #89. Pennsylvania, Veterans Burial Cards, 1777-1999; http://www.ancestry.com. 1870 census, Reedsville P.O., Brown Township, Mifflin County, Pennsylvania; roll M593-1375, page 271, line #2, dwelling #92, family #96.